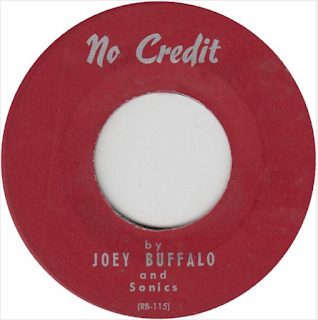 I first heard of Joey Buffalo and Sonics probably five years ago, when I started putting together the idea for this blog. Numerous Pueblo friends, and Colorado record collectors, suggested I research the group, and locate their one and only single - one that eluded them, but they assured me existed. So fast forward to this summer. I posted on a local Pueblo Facebook site that I was looking for the record, and if anyone knew anything about this band. Lo and behold, I received a note from a former Pueblo resident, living in Denver. She had the record, and offered to give it to me! Listen to samples of both sides of single. There is absolutely no information on the single, minus a small "RB 114 / RB 115" on the bottom of each side ("Ladder of Happiness" appears to be the A-side). The generous gift-giver admitted that she received the record at a local nightclub, but couldn't give me any other information on the single. "They were passing them out the same night I got my Guys and Doll record, so up until that time I had never heard of them, except that they were a Pueblo group," she said. While doing research I also managed to find out that Joey passed away in 1995. His widow, Donna Corsentino Buffalo, informed me that he graduated high school in 1965 (Pueblo County High), then joined the U.S. Air Force. After serving four years, he then went to work for the railroad. He met Donna in 1977, so she had very little knowledge about his time in the band. A relative of Joey's told me to look up Bob Welborn, who at one time was the lead singer and drummer of Sonics, and was also in the American Beatles, a popular early 1960s, Pueblo-based, Fab Four tribute band. Unfortunately, Bob's memory of his time in both groups is very hazy. He thought, but couldn't be certain, that Sonics were made up of Fred Brescher (later of the Trolls), and a bass player, Leroy Brego, but then suggested that the same members were also in the American Beatles. Bob admitted that he never knew that Sonics ever recorded a single - and it certainly wasn't him singing on the record I located. To make it even more confusing, there was another Joe Buffalo in Pueblo (a cousin of Joey's), who was an accordionist for Chuck Spurlock's band. That's all I have. I'm tapped. If you have any additional information you can provide, let me know.